If I could name the one thing that has kept me sane over the past 17 years of parenting 6 kids, it would have to be quiet time. Listen, I’ve got 6 kids between the ages of 2 and 17, five of them are rowdy, rambunctious boys and the one girl holds her own with her brothers (plus, she never stops talking!) And I LOVE my kids and I love that I get to be home with them. That I have the ability to homeschool them. But…. But I am am introvert who needs time to recharge. I work from home and need at least some time to my own to work without interruption during the day. 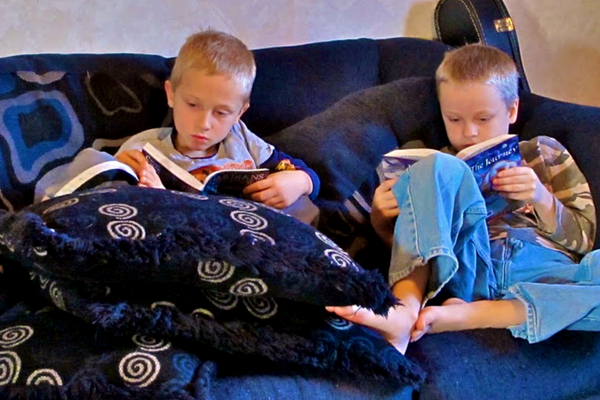 Why Do Your Kids Need Quiet Time Every Day? It’s not all about me though. Sure there are days when my kids groan when they hear me call out, “It’s quiet time!” but most of the time I hear happy calls of and the pounding of feet as they come running from wherever they are. They NEED quiet time as much as I do. They need time away from each other. Time to recharge. Time to rest. As a homeschooling family, the older kids use quiet time to do the work that requires more concentration. It’s hard to do Algebra with your 2 year old brother or 7 year old sister playing in the room beside you! Quiet time is also a great way to encourage a love of reading- from a very young age my kids have used books as a main quiet time activity- even at 2 years old, paging through picture books helps set them up for a love of reading later in life. We’ve never not had quiet time. My oldest son went straight from taking a nap to quiet time. And all other kids have followed. All my kids have dropped naps around 2 years old, and believe me, I wasn’t ready for it! It may take some time to get in a good rhythm but by always having a quiet time, your child will not fight it. It will be an expected part of their day. 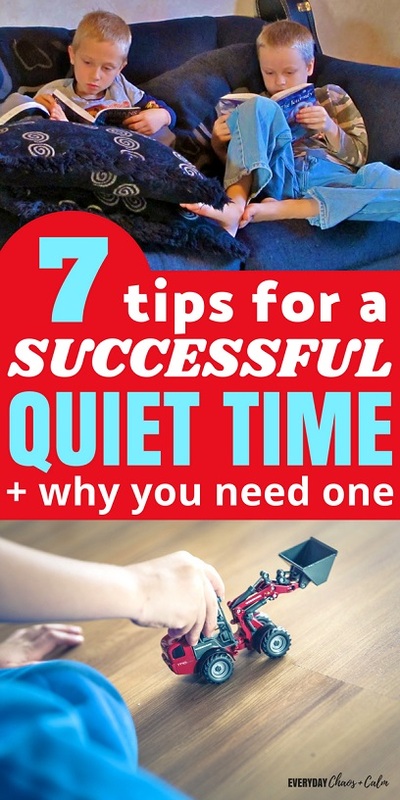 I have also always called it Quiet Time. So even though my 2 year old naps half the time, he knows it as quiet time. And he knows what to do. *Tip for the youngest kids: Have them have quiet time in a room with you, but in a set space like on your bed, on a blanket on the floor, or at the kitchen table. Consistency is key to creating any new habit, and quiet time is no different. In our house quiet time is always the same. It starts at 12:30 and runs for 1 hour. Every single day that we are home. Kids thrive on a schedule, when they know what is going to happen every day. They will also be calmer and more likely to stay quiet and play independently when they know there is a set time for it to be over. Get a large clock for them to read. Set a timer to 1 hour. Since I work from home and I use this time to work. I do the same thing every day- meaning I am in one place, working quietly. Quiet time will not work as well if you are busy moving about the house. Cleaning. Vacuuming. Talking on the phone. Etc. YOU need to be quiet too. Use this time to recharge. Catch up on reading. Take a shower if your kids are old enough to be without supervision. Your kids need to know what they can and can’t do during quiet time. And they need to know what kind of things they are allowed to interrupt you for. In our house my older kids listen to audio books or read silently. They are all in separate rooms- no talking or playing with each other. They are allowed to play with anything in their space as long as it’s quiet. Sometimes my teens are allowed to use their tablet- but not usually. They also know that they are not supposed to come and bother me for anything that is not an emergency. Our quiet time is always about 30 minutes after we eat lunch. This means that no one is hungry or thirsty. They’ve had the whole morning with me and each other, so even an extrovert’s tank would be full. My kids aren’t stuck in their rooms- they can come out and use the bathroom, get a drink, etc. throughout quiet time as long as they aren’t disturbing someone else. Emergencies are up to interpretation around here. So even though they aren’t supposed to come to me unless they are sick, bleeding, or some other catastrophe, they do. Especially when they are young and first switching from naps to quiet time. Interruptions such as: Is quiet time over yet? Can I play with…..? The mail just came. Look at what I built. In order to train them to a quiet time where they can handle situations on their own you need to not engage when they come to you with questions or activities. Nod your head in answer. Remind them that this isn’t an emergency. Remind them that the timer will alert them to when quiet time is over. And then direct them back to their own space. With older kids this isn’t so much a problem. They are content to read or play with Legos or listen to an audio book. But younger kids, especially those who are still getting used to independent play, need a little more help. Set your toddler up with a variety of activities in their space so they can rotate activities for the duration of quiet time. As I write this, my 2 year old is on my bed. He’s got a small stack of picture books. A few cars. A basket of pattern blocks. And his blanket, in case he decides to nap. We’ve got music on- to drown out the sound of his play and the sound of my typing. And my back is turned so he’s not encouraged to come and talk to me. And now it’s 1:30- which means my time is up! So I just have one last tip for a successful quiet time: When the timer rings. Stop quiet time. Stop what you are doing and go play and interact again. Read the picture books they’ve been looking at. Go outside. Play a board game. Knowing that you are fully available for them after quiet time is just one more thing that helps them get through an hour of silent, independent play.